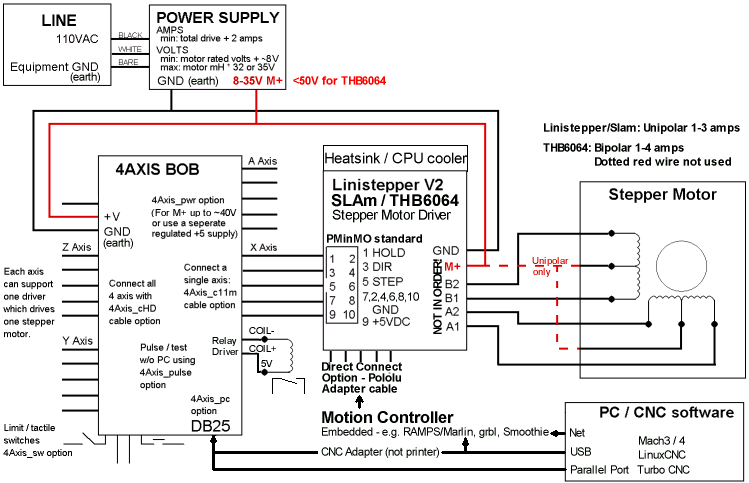 This block diagram of a stepper motor control system shows the basic components and links to more detailed information. Click on the highlighted areas. What are the issues involved with driving the THB6064 with 1 voltage (say 50V) and a controller board at 12V? by looking at the circuit diagram it appears that the logic ground and the motor ground on the THB6064 are common. I have some 24ohm, 0.4A, 6 wire unipolar steppers. That means 9.6Volts to the motor. I'm using a PC power supply for 5V logic and 12V for motor power. Should I leave the center leads disconnected and run the motors as bipolar (to match the block diagram)? By connecting the 12V to M+ on the linistepper and using the appropriate power resistors from the tuning page? That would be 2.5ohm power resistors. The power supply would not be connected directly to the motors. Or how do you wire unipolar motors to use the center leads? Should I step the 12V down to 9.6V and connect that to the center leads? Leave M+ and GND on the terminal block disconnected?